For groups of 15 or more with 72 hour advance reservations. Tour Operators, please use our contact form to receive pricing information. We will respond within 24-28 hours. Groups who arrive without confirmed reservations will be given the discounted rate and integrated with our general public programming rotations. Groups can explore Jungle Adventures together, and at a discount. Enjoy an exciting, great day of Live Guided Adventures, Education and Fun. 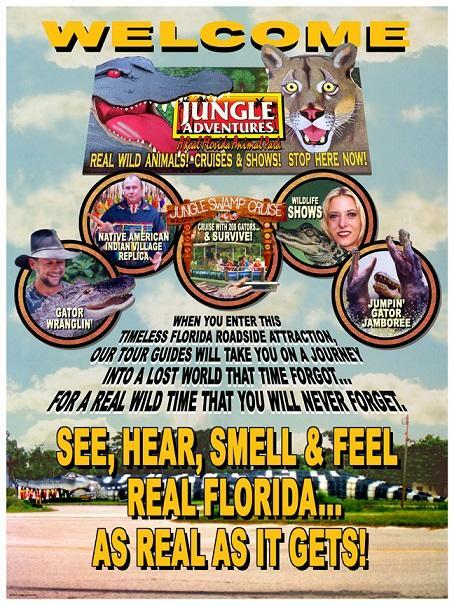 Experience an Alligator surrounded Jungle Swamp Cruise, A Hands On Wildlife Experience, Gator Jamboree Feeding, and a visit through the Native American Indian Village. $13 per ages 12 and older, $9 per child ages 3 to 11. Children under 3 are free. Enhanced Adventure Packages include extra special goodies added to the Group Adventure. Add Critter Chow/Baby Alligator Chow and a personal souvenir photo magnet holding the Baby Alligator during the Hands on Wildlife Experience. $5 per person. Groups are welcome to bring their own lunches to the park for their visit as well letting us provide lunch for them. Choices are pizza (2 slices, pepperoni or cheese), chips and beverage or 4” sub sandwich (turkey or ham), chips and beverage. Lunch must be ordered 48 hours in advance and be of same type (all subs or all pizza). $6 per person. Additional packages are available for larger appetites. All prices plus tax, except any tax exempt group that provides a copy of its own Tax Exempt Certificate. All rates and prices are subject to change without notice. We understand that plans can change, so please follow these few rules to make your Jungle Adventures experience great. If you need to change or cancel your reservation, please be sure that you give us at least seventy-two (72) hours prior notice. Deposit/and or advance payments refund requests may only be honored if received within seventy-two (72) hours after the deposit and/or advanced payments was received.